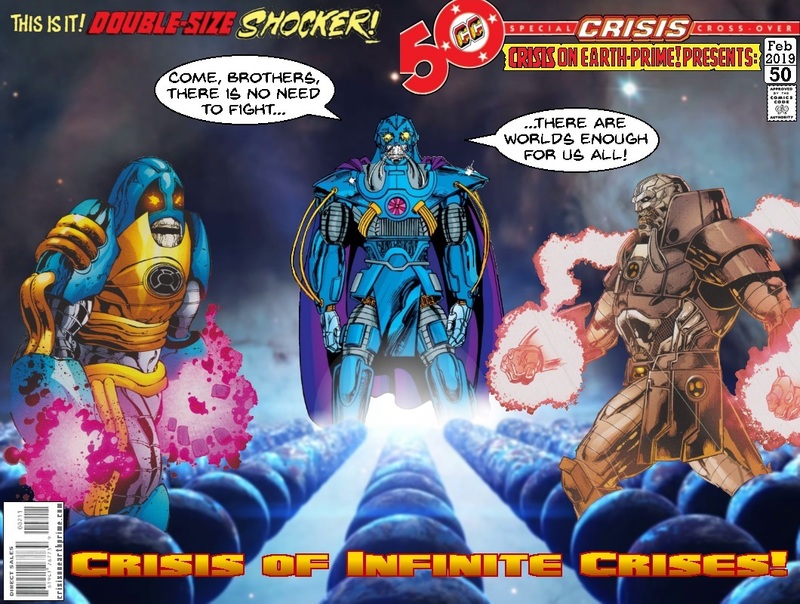 This is what all the Monday Crises over the past few weeks have been building to – a throw down between the various versions of the Anti-Monitor: Sinestro Corps guardian, original, and Darkseid War version. And a battle this big needed a double sized issue! Posted on Monday, February 11, 2019 Tuesday, January 29, 2019 by GaryPosted in Mash-UpTagged Anti-Monitor. I give any alliance five minutes before one of them stabs the others in the back. So, in Darkseid War, did Darkseid turn himself into the Anti-Monitor? The guys face looks like it has the same cracks in it as Darkseid. Maybe the Anti-Monitor is anti-moisturizer. Nope, Darkseid fought (and was killed by) the Anti-Monitor who turned out to be a New God of sorts called Mobius – the original owner of Metron’s chair. Pretty damn cool cover Gary. I like it. So, who wins? Surely they’ll team up together and divide the multiverse up between them . . . ? Glad you liked it as it took a bit of work.